Roasting a good turkey takes time. If you use an aluminum roasting pan, put a sheet pan under it and do not lift the foil pan without the sheet pan support. See the post on 4 ways to safely thaw food. Whenever you handle poultry products, act as if you are handling potential contaminates. Defrost in the refrigerator: at least 5 hours per pound. If on roasting day it is still not thawed, complete the thawing under clean running water. Again, see 4 safe methods for thawing food. Be sure to wash your sink both before and after rinsing the bird. Remove the bird from the wrapper. Do this in the sink because of all the juices that will be in the bag from defrosting. If your bird has a bag of giblets, neck and livers, remove it. Some use these to make a stock and gravy but I don’t. Your Grandfather (my dad) loves the neck! He would boil it and then pick all the little slivers of meat off the tiny neck bones, savoring every morsel. You, on the other hand, can throw them away unless you like such things. Before the oven gets hot, take a look at the shelves and adjust them so the turkey will fit in. In my oven the only rack that will fit is the bottom rack. It leaves just the right amount of space between the top heating elements and the bird. While the oven is preheating, finish preparing the bird. Place your aluminum roasting pan onto a sheet pan for safety. The aluminum pan is not strong enough to hold a 15-pound bird without support. Chop carrots , celery and onions (not you, Tyler) to line the bottom of the roasting pan. 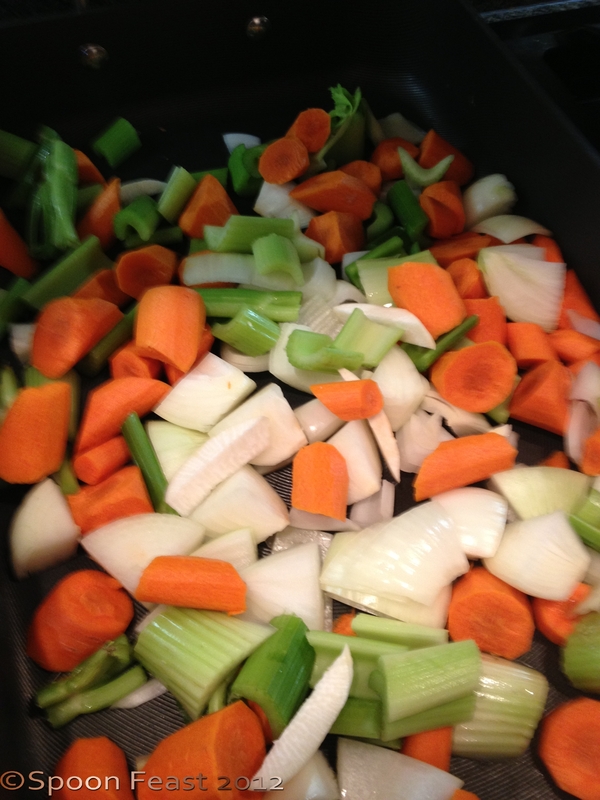 Chop your carrots and celery into chunks and place them on the bottom of the pan. If you liked onions, you would put some of those in there too. Since you don’t like them, leave them out. Place the turkey, breast side up into the pan. Tuck the wings under the shoulders so the tips don’t burn in the long roasting process. Gently loosen the skin and press some seasoned butter under the skin. This will help baste the bird as it roasts. Season the skin and place some herbs, orange or citrus fruit into the cavity. Season inside the bird too. Season it with salt, pepper, your favorite spice mixture, what ever seasonings you like. Tie the legs together and plump up the breasts. 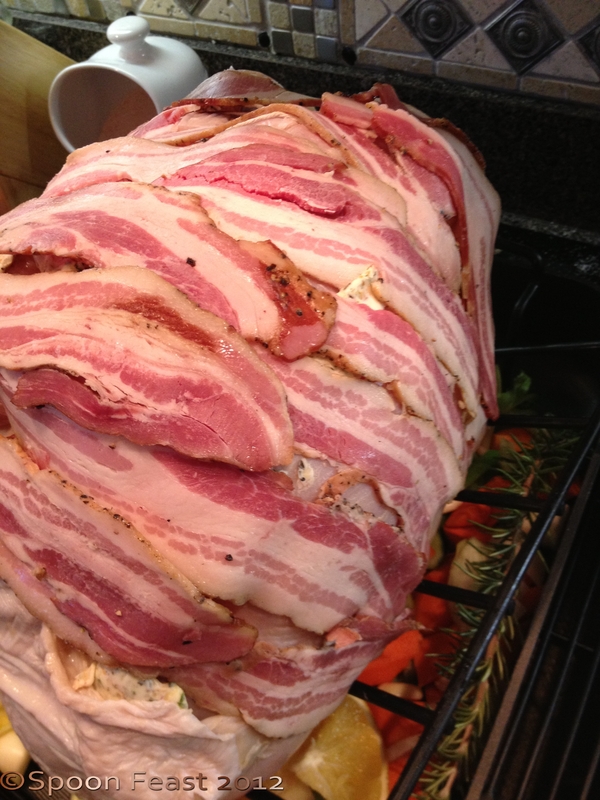 Cover the surface of the turkey with bacon strips. Place the supported roasting pan into the oven. Reduce the heat to 325°F. Roast until the internal temperature reads 165°F or higher in the leg or thigh. For your 15 pound bird that will take about 3 1/2 to 4 hours, maybe longer. My 17 pound bone-in breast took 6 hours. If the bird starts to get too brown, cover it with a tin foil tent. 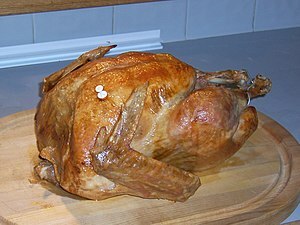 When the bird is done, remove from the oven and allow the bird to rest at least 1/2 hour (covered in foil) before carving. How do you carve a turkey? I found this video on You Tube that shows you step by step. I didn’t have time to make a video for you, sorry. Enjoy your Turkey! Take pictures of your first. How odd in our culture, roasting your first turkey is some kind of right of passage. I love cooking this meal and hope you do too. Watch the carving video, use a sharp knife and enjoy your dinner! Place your cutting board in a sheet pan to catch all the juices that run out while carving. Stir these juices into your gravy. Tyler, remember, I am just a phone call away if you get stuck. There are also many other “Turkey Hot Lines” for those who get stuck. If all else fails and you totally blow it, Chinese restaurants are usually open on Thanksgiving as an Emergency Back-up Unit. This entry was posted in basic skills, Recipes and tagged Bird, cook, cooking turkey, cooking your first turkey, Defrosting, Oven, Roasting, roasting a turkey, Thanksgiving, Turkey. Bookmark the permalink. ← How to make Cranberry Sauce – easier than you think! Aw, Celia, you’re missing out! Roasting turkey is really kind of fun to do. Your house smells amazing all day! Tyler is a lucky young man to have you as his mom. I hope everyone had a great Thanksgiving.